It's time again for the Alachua County Friends of the Library Spring book sale. I have not been reading nearly as much lately, mostly due to my running habit, but I do still like to go to the book sale just to browse. I only bought a few books this year as I still have a few on my shelf from last year. 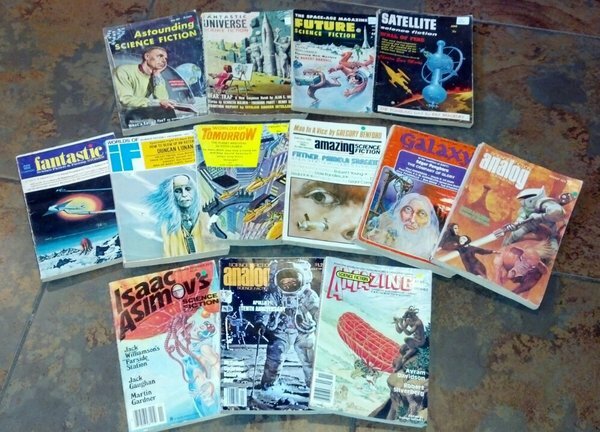 This time I noticed that they had dozens and dozens of old Science Fiction magazines. At first I skipped over them, but then I saw the publication dates included the 1970s. edit: The photo includes magazines dated from the 1950s - 1980s. There's still time left to find a bargain. Tomorrow (Wednesday) is 10 cent day! I read 17 works of fiction during 2011. This number is down from the previous two years. Family, running, and the new job has cut into my reading time. I am doing my best to make more time for reading every day, mostly by spending less time squandering my time away on the Internet... but that also means less time for blogging. Hence, I find myself summarizing 2011 in the middle of February. I have not had much time for reading lately and have been reading some non-fiction (especially running books), so progress on my fiction book list has slowed considerably. I am doing my best to make time every day to read, but usually just manage a few pages before bed. Just like last year, I bought a few hardback books to replace the paperbacks on my shelf. "King David's Spaceship" by Jerry Pournelle in hardback was a good find. I was also glad to find "Footfall" by Larry Niven and Jerry Pournelle in an excellent condition hardback. I only attended the sale on half-price day, so I didn't spend very much money on these at all. The in-laws also found a few books to add to my shelf. They said "you gotta read some Lem!" In 2010, I read 44 works of fiction, which is about half as many as I read the previous year. My interest continued to be mostly in the Speculative / Science Fiction genre. Many of these books were my lucky finds at the Alachua County Friends of the Library book sale or one of the local Gainesville book stores, Book Gallery West and Books, Inc.
My two favorite books from my 2010 reading list were Dragons in the Stars and Dragon Rigger, both by Jeffrey A. Carver and take place in Carver's Star Rigger universe. I enjoyed Birth of Fire by Jerry Pournelle more than Heinlein's Starship Troopers or Haldeman's Forever War. Scott Westerfeld is one of my new favorite authors. After reading The Risen Empire and The Killing of Worlds, I am eagerly awaiting the next book in the Succession series. Potentially offensive to some readers, Bring Me the Head of Prince Charming by Roger Zelazny and Robert Sheckley is notable for its entertainment value, poking fun at heaven and hell, demons, and angels, good and evil. Cuckoo's Egg by C. J. Cherryh is an excellent "master with student in training" kind of story. The Alachua County Friends of the Library fall 2010 book sale is over. I was happy to find a few copies of books I had already read to add to my keeper / loaner bookshelf. In particular, "Snow Crash" by Neal Stephenson is great to have so I can loan it out to other computer geeks. I also bought a copy of "A Fire Upon the Deep" by Vernor Vinge that is in much better condition than my existing copy. I decided to buy just a few books that I have not yet read, but in most cases I had already read at least one work by the author and liked it. Alachua County Friends of the Library Book Sale Rocks (Again)! The Alachua County Friends of the Library spring book sale has come and gone. I love that sale! I had my Droid with me so I could look up book reviews using the Amazon shopping app for each book before buying... thus I bought a few more books than last time. Monday through Wednesday were very convenient for me since I work just down the street from the sale. I think I only spent about twenty bucks total. I was happy to pick up some copies of books that I had already read but did not own. I also found a few books that I had on my reading list to watch out for. The most interesting looking titles (that is, the titles themselves were interesting) were Great Mambo Chicken & the Transhuman Condition and The Millennial Project - Colonizing the Galaxy in Eight Easy Steps.